Full length native protein (purified) corresponding to Dog NCX1. Purified from canine cardiac sodium/calcium exchanger. This antibody recognizes an epitope between amino acids 371-525 on the intracellular side of the plasma membrane. IHC-P: Normal human kidney tissue. This antibody clone is manufactured by Abcam. If you require a different buffer formulation or a particular conjugate for your experiments, please contact orders@abcam.com. The sodium/calcium exchanger of cardiac sarcolemma rapidly transports calcium during excitation-contraction coupling and is the dominant myocardial calcium efflux mechanism. The sodium/calcium exchanger uses the transmembrane sodium gradient to catalyze countertransport of calcium against its electrochemical gradient in a 3 sodium : 1 calcium exchange. Sodium/calcium exchange activity is present in excitable cells and in non-excitable cells. Our Abpromise guarantee covers the use of ab2869 in the following tested applications. Rapidly transports Ca(2+) during excitation-contraction coupling. Ca(2+) is extruded from the cell during relaxation so as to prevent overloading of intracellular stores. Expressed in cardiac sarcolemma, brain, kidney, liver, pancreas, skeletal muscle, placenta and lung. Belongs to the sodium/potassium/calcium exchanger family. SLC8 subfamily. 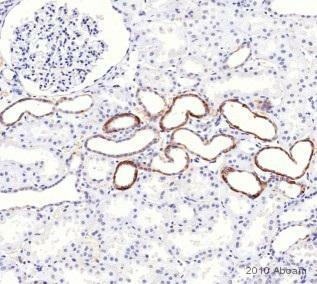 IHC image of NCX1 staining in a section of formalin-fixed paraffin-embedded normal human kidney* performed on a Leica BONDTM system using the standard protocol F. The section was pre-treated using heat mediated antigen retrieval with sodium citrate buffer (pH6, epitope retrieval solution 1) for 20mins. The section was then incubated with ab2869, 5ug/ml, for 15 mins at room temperature and detected using an HRP conjugated compact polymer system. DAB was used as the chromogen. The section was then counterstained with haematoxylin and mounted with DPX. The inset secondary-only control image is taken from an identical assay without primary antibody. Overlay histogram showing HEK293 cells stained with ab2869 (red line). The cells were fixed with 80% methanol (5 min) and then permeabilized with 0.1% PBS-Tween for 20 min. The cells were then incubated in 1x PBS / 10% normal goat serum / 0.3M glycine to block non-specific protein-protein interactions followed by the antibody (ab2869, 1/100 dilution) for 30 min at 22ºC. The secondary antibody used was DyLight® 488 goat anti-mouse IgM (mu chain) (ab97007) at 1/500 dilution for 30 min at 22ºC. Isotype control antibody (black line) was mouse IgM [ICIGM] (ab91545, 2µg/1x106 cells) used under the same conditions. Acquisition of >5,000 events was performed. This antibody gave a positive signal in HEK293 cells fixed with 4% paraformaldehyde (10 min)/permeabilized in 0.1% PBS-Tween used under the same conditions. 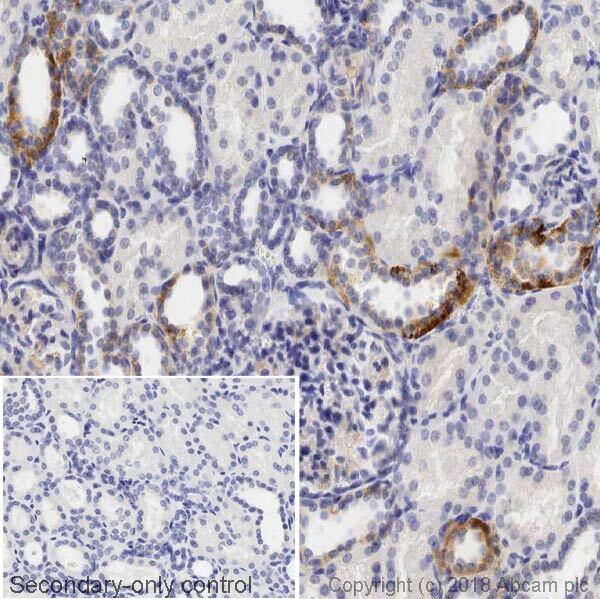 ab2869 staining NCX1 in Human kidney tissue sections by Immunohistochemistry (IHC-P - formaldehyde-fixed, paraffin-embedded sections). Tissue was fixed with formaldehyde, permeabilized with 0.05% Tween20 and blocked with 5% normal goat serum in 1XPBS + 0.05% Tween20 for 1 hour at 25°C; antigen retrieval was by heat mediation in sodium citrate (pH 6.0) buffer. Samples were incubated with primary antibody (1/100 in blocking buffer) for 1 hour at 25°C. Ab47827 (1/500) was used as the secondary antibody. 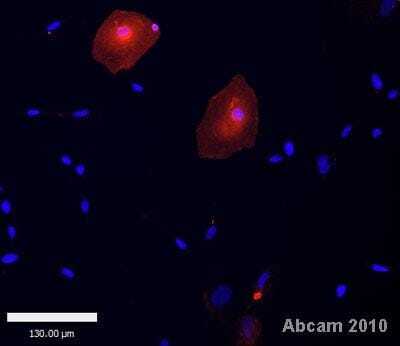 This image shows Human embryonic stem cell derived cardiomyocytes, stained with dapi (blue) and anti-NCX1 antibody ab2869 (red). The cells were fixed in paraformaldehyde, permeabilized with 0.1% Triton X-100 in PBS and blocked with 4% goat serum for 1 hour. The cells were then incubated with primary antibody (1/100) for 16 hours at 4°C. Publishing research using ab2869? Please let us know so that we can cite the reference in this datasheet. Our customer retested following your recommendation but the band still did not show in positive control (Hek293 cells). She said that secondary antibody has been used for WB without any problem. Thank you and your customerfor taking the time totry the tipsand contact us. I am sorry to hear your customerhas had difficulty obtaining satisfactory results from this antibody. The details your customerhas kindly provided will provide us with vital information for our monitoring of product quality. I appreciate the time your customerhas spent in the laboratory and understandtheir concerns. It is regrettable the results have not been successful. Reviewing the details, I am sorry there are no further tips to provide on this occasion to help improve the results. I can suggest your customerhas regrettably received a bad vial. I apologise for the inconvenience and am pleased to offer your customera free of charge replacement (also possible with an alternative antibody) or credit note in compensation. Thank you and your customerfor your cooperation. I look forward to hearing from you with details of how your customerwould like to proceed. Inquiry: Our customer would like to know what size detected in human sample. Please let me know. Thank you and your customer for your inquiry. I can confirm that ab2869 detects a 120 kDa protein representing the sodium / calcium exchanger from guinea pig cardiac extract. The bands seen at 70 kDa and 160 kDa represent a proteolytic fragment and non-reduced exchanger respectively. The human protein shows the same molecular weight and I assume that bands at 70 kDa and 160 kDa also present a proteolytic fragment and anon-reduced exchanger respectively. Liu J et al. Functional sarcoplasmic reticulum for calcium handling of human embryonic stem cell-derived cardiomyocytes: insights for driven maturation. Stem Cells 25:3038-44 (2007). This publication also uses milk for blocking and a over night incubation of ab2869. 1. ) I suggest to use a positive control. Hek293 cells and human kidney are shown to be NCX1 positive. 2.) I can also suggest to check if the secondary antibody works. 3.) NCX1 is a multi pass protein and I therefore do recommend not to boil the samples but only to heat them up to 70C for 10 minutes. I hope this information is helpful. please do not hesitate to contactme again with any further questions in this matter.